Energy Cost Attack is a solutions driven business. We work to understand your expectations and then optimise the best lighting design to deliver a code compliant lighting solution for your property. The clever sensor is pictured on the right. This allows us to optimise energy savings without compromising the lighting amenity in a given space. 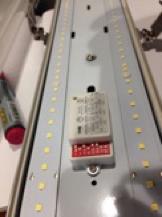 LED lights can replace every ‘fluoro’ or metal halide light in your building. LED lights use less than half the energy (watts) to produce an equivalent amount of light to fluorescent lights. Add a Motion or Daylight Sensor and the energy used on standby drops to around 10% of a standard fluorescent light. 36W x2 + ballast about 12W = 84W down to LED 36W at 20 % = 7.2W on stand by. LED lighting has constantly improved and it is common to see LED lights producing 100 lumens per watt or more. This compares to a fluorescent tube that typically puts out 60-70 lumens per watt. (Light output is measured in Lumens. The Luminous efficacy (light efficiency) is measured in Lumens per Watt. ) This explains in large part why LED lights are so energy efficient. By specifying and installing LED lights, we eliminate all the mercury that is used in fluorescent, metal halide and mercury vapour lighting, making your building safe from mercury contamination.